Sri Dharma was born in 1939 in the small, remote village of Pirapora, Brazil and was raised Catholic in a poor family of 5 children. In his early teens, he became involved in esoteric teachings and yoga through books his younger brother was studying. From 1958 through 1964, Sri Dharma served in the Brazilian National Air Force and practiced bodybuilding, wrestling and Brazilian Jiu-Jitsu. In 1962, he he took top honors in a national bodybuilding contest, achieved second place in power lifting and was awarded the title “Mister Minas Gerais” (the state in Brazil he is from). Sri Dharma had only practiced yoga through books in his late teens when his younger brother Sattya went to New York City to meet and commence studies with their future Guru (teacher; spiritual preceptor). Sri Dharma left the Ashram to live his destiny — a life dedicated to sharing and spreading the truth, knowledge and light of God through yoga in the most humble and quiet of ways. Over the years, the Yoga Asana Center that is now known as the Dharma Yoga New York Center was located at many locations throughout Manhattan. It is currently located on the 6th Floor of 61 West 23rd Street. For many years, Sri Dharma was the only yoga teacher in New York City teaching advanced yoga postures. Teachers from other schools and Ashrams have always come to him to learn, practice, and then teach elsewhere. Sri Dharma is truly a sweet, gentle master who sets the greatest example of yoga by living what he teaches and asking nothing in return. He continues to be that same selfless, shining example today. Sri Dharma Mittra was one of the first independent yoga teachers on the East Coast and has initiated hundreds of thousands on the path of Yogic practice and teaching. Sri Dharma began disseminating this knowledge long before styles of yoga became popular and he has always remained true to the classical practice he received from his Guru. Students from all walks of life and schools of yoga love his method of teaching. Sri Dharma has been teaching classes continuously almost every day since he first started in 1967. To this day, he still makes himself available regularly to anyone who walks through the doors of the Dharma Yoga New York Center in need of help and direction. He is affectionately known as a “Teachers’ Teacher”. Sri Dharma is a most beloved Yoga Master, known for his humility, humor, joy and kindness. He is the teacher with the most mileage: “The Rock of Yoga”. Every student who comes to his classes, workshops and immersions is treated as part of his family. He diligently teaches Yama, the first step of yoga. 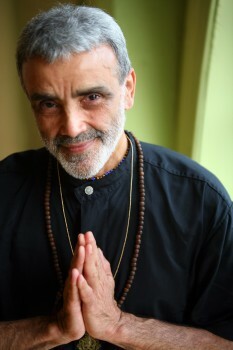 You will regularly hear him say: “Without the Yama, known as the Ethical Rules, there is no success in yoga.” Sri Dharma tirelessly promotes Ahimsa (non-harming) through vegetarianism, veganism, a live-food yoga diet and kindness to all living beings, especially our inferior brothers and sisters of the animal kingdom. In 1975, Sri Dharma created the Sun Salutation and Yoga Course Chart. This chart includes original drawings and artwork, as well as photographs and two yoga class programs. Over many years after its creation, this course chart and a handful of fresh sprouts were often given to all departing students as a free gift from Sri Dharma. In 1984, Sri Dharma completed the Master Yoga Chart of 908 Postures as an offering to his Guru for all yoga aspirants. This original masterpiece was meticulously assembled from over 1,350 photographs of posture variations he took of himself, all hand-crafted before the computer age. Over 300 of these now-popular posture variations were created by Sri Dharma, though he will always say they only came through Divine intuition. The poster has been an invaluable teaching tool for decades. 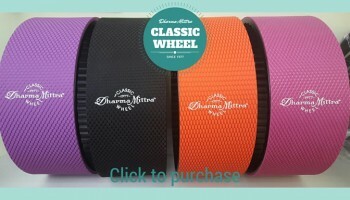 It can be found in many yoga studios, schools and Ashrams worldwide, including in India. The poster was the inspiration for Yoga Journal’s book Yoga where Sri Dharma himself is featured demonstrating an advanced Headstand series. 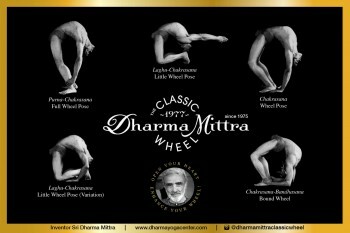 Sri Dharma Mittra is the author of 608 Yoga Poses, published by New World Library, and was featured in the book American Yoga. His Maha Sadhana DVD set including Level I – “A Shortcut to Immortality” and Level II – “Stairway to Bliss” have been widely acclaimed for their lucid preservation of the main teachings of yoga. These DVD’s include over 8 hours of Asana (posture practice), Pranayama (breathing exercises), spiritual discourses and Kirtan (spiritual call-and-response chanting) and provide an amazing overview of Sri Dharma’s almost half-century of dedication to the yoga tradition. Sri Dharma Mittra conducts Maha Sadhana, Divine Purification and Yogic Treasures For a Shortcut to Immortality workshops worldwide at retreats, festivals, conferences and various larger yoga schools and studios. Dharma Yoga Levels I, II, III, IV, V Shiva Namaskar Vinyasa are a stairway to bliss that reintegrates the continuous flow of Prana (cosmic life force energy) through the spinal column so that it emanates deep into all areas of the physical, metabolic, intuitive and bliss body. Dharma Yoga I-V Shiva Namaskara Vinyasa have been embraced by Yogi’s from all schools and styles for their unique integration of the classical spirit of true yoga with a thorough mobilization of the physical body. This promotes contentment, merging complete identity with the that of the True Self, the great goal of yoga. Many have told us over the years that they now know what yoga is after meeting and studying with Sri Dharma, even after they have been practicing for years. This is testament in itself to Sri Dharma’s great gift to yoga practitioners, yoga teachers and society at large.